Grant Estate Agents are now in receipt of an offer for the sum of £59,950 for 69 Balfour Street, Newtownards BT23 4EE. Anyone wishing to place an offer on this property should contact Grant Estate Agents, 7 High Street, Newtownards, Co Down, BT23 4JN on 028 91 828 100 before exchange of contracts. This attractively priced terraced property offers 2 bedrooms, a lounge, a relatively modern kitchen with dining area and a ground floor bathroom. It benefits from uPVC double glazing and oil fired central heating. Externally there is an enclosed yard to the rear with a pleasant garden beyond in lawn. It is centrally located close to Newtownards town centre. Double radiator, understairs storage cupboard, stairs to first floor landing. (L-shaped). Range of white units with granite effect sparkle worktops, stianless steel sink, oven, hob and extractor hood. Tiked floor. uPVC double glazed door to rear yard. White suite comprising panel bath, WC and pedestal wash hand basin. Tiled floor and walls. Single panel radiator. Extractor fan. (at widest points) Single panel radiator. Hot-press. Enclosed yard to rear with uPVC oil tank and oil fired boiler. Garden beyond in lawn with steps and rear pedestrian access. Balfour Street is located parallel to Talbot Street and Robert Street and is easily accessed via Marquis Street or James Street. 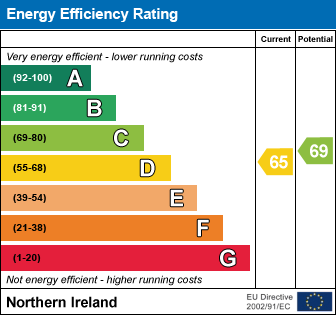 I am interested in 69 Balfour Street, Newtownards. Please contact me about this property.